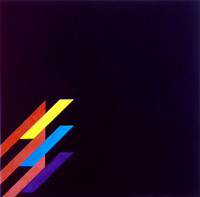 With the diagonal, Stankowski brought his own element into his constructive work, which distinguishes it from works by the Zuricher Konkrete, for instance. He used it for the first time in his paintings in 1960. 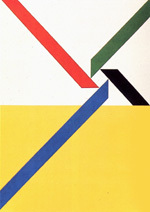 Yet even before that, the oblique line in graphic design stood for new beginnings and dynamics — or for a fall. Depending upon the color coordination, diagonals created harmony or aggression in motion; depending upon their position, they affected space in terms of height, depth, and width. 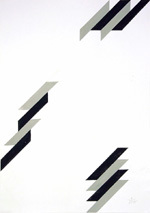 Stankowski developed the oblique from the rectangle, yet another important element in his work. 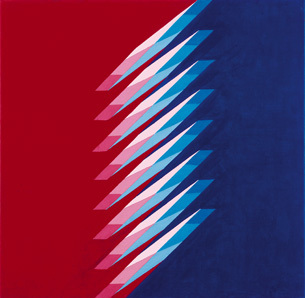 Obliques can be found in all areas of Stankowski’s work: at first, in the deliberately selected diagonal perspective in his photography, then in the diagonals in the trademarks — just think of the Deutsche Bank symbol — to the rich variety of diagonals in his paintings. Still, he never allowed himself to use the oblique line as a simple formal element. It had to have a function, and if it did not, then he could also choose the softness and joy of a curve.